Grottel is a sans-serif typeface created by Rebecca Hurst and published by The Northern Block Ltd which comes out in 5 weights, an European character set and some useful OpenType Features. Ligatures have been carefully considered to allow letters to sit comfortably together creating a beautiful and readable typeface. It is a functional typeface waiting to be explored! 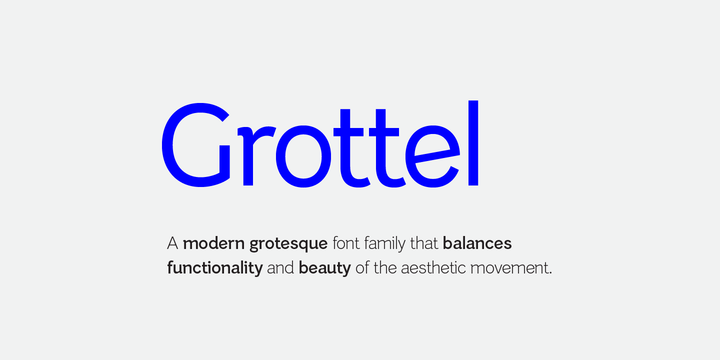 Note: Grottel is a trademark of The Northern Block Ltd.
A font description published on Friday, November 14th, 2014 in Fonts, Rebecca Hurst, The Northern Block by Alexandra that has 3,639 views.